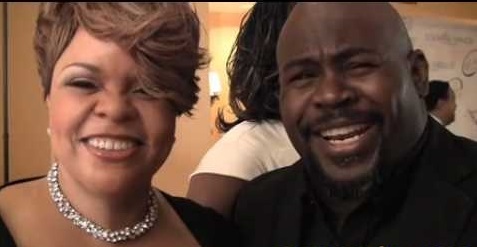 looking mighty fancy as usual, but were attending the premier of Tyler Perry's Why Did I Get Married Too....I know right, the video is kind of old, but David Mann, Tamela's husband had some interested advice for marriages. You know usually we hear the advice from Tamela, but when David started speaking up I straighten up. I was so inspired to see a man giving some advice on how to keep a marriage together and by they way they have been married now for 25 years. Go head David! One of the important themes of Why Did I Get Married Too, is marriage, so tell me how do you make your marriage work? Wow, A lot of love! We genuinely enjoy each other's company. You want to be with someone you like. Nobody wants to hang around someone they don't like. A lot of love! And learning to agree to disagree, that's how it happen so far. What are some things you guys enjoy doing with one another. Sometimes, sitting doing nothing. Enjoying life. Yes! It's the simply things. Having a sandwich, it could be a $10 meal, it could be a $200 meal. Just to sit down, have a sandwich, and talk things out. We talk about everything, there are no secrets between us. And having a great family, we have 5 grand kids and 4 kids (David laughs and says a lotta of kids...a lotta of love making). What is some advice you guys have for couples working through tough times? Don't allow adversity to break you up. We are having a really tough economic times, but don't allow the adversary to come between you all. All it is, is a trick of the enemy. You can work through anything. We have learn to work through a lot of different things in our life and working together. Again, learn to agree to disagree. This thing is a 50/50 thing. And mean your vowels when you say it and work through it, because things are going to happen. It's just like a circle, you are going to have to start over with somebody else if you start over or if you quit.